Wow, ten years have passed since I last wrote an update on my son, Chad, PA. My last article was in the June 2003 issue. As I try to figure out where to begin, I guess I will start by a brief introduction. My name is Sandy, single mom to two boys, Michael, age 27, and Chad, 20 years young in May 2013. Only Chad has PA as the boys have different fathers. We live in Hilo, Hawaii. Both boys were born and raised here. Hilo is a small town on the Big Island. Over the years I have thought of moving some place that would possibly offer more opportunity for the boys, but we have an awesome support network here and I truly can't imagine living anywhere else. Michael graduated, with honors, from the University of Hawaii at Hilo with a BA in English. 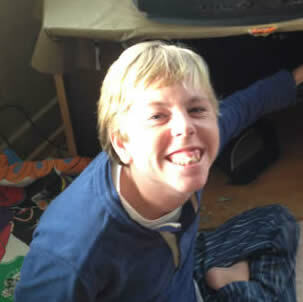 Currently he works with Chad as his home hospital tutor and afternoon personal assistant. This year he is working on applying to Cornell for his graduate studies. I am VERY proud of him. Being raised in a single parent home with a disabled brother has had its challenges and opportunity to see life in ways most aren't blessed to live. Hence, he is a poet with insight on life that he hopes to share with others. As I mentioned Chad is home hospital tutored. This is the second time in his public schooling that we have utilized home tutoring. The first was when he was elementary age, at the time he was too fragile to attend school and I guess I was fearful of what could occur in the public setting. At that time he had an indwelling Hickman catheter as I was running IV fluids and TPN on him daily. The fear of infection was always on my mind. Currently, he is home tutored due to falling at school. His first fall was March of 2012. This last fall was September of 2012. More on these falls later. Looking back, the years from Chad's tenth birthday to around age 15 were great. No significant illnesses, only occasional colds that we managed at home and generally lasted about a week or so. Potty training happened during this time, BIG relief, and we were more active than ever imagined. Nearly every day, weather permitting we went to the beach. Chad loved going so much that even days when it was a bit chilly Chad still demanded we go to the water, (Chad has a sound he uses to communicate water). On those chilly days he still got in the ocean while I stood there freezing!! No Chad doesn't swim, he uses a "swim ring", and as his confidence grew he asked to go out to the waves and bubbles. That is out quite far where folks are body boarding and surfing, I took him but always prayed for safety. Not knowing how long his life will be, I continually try to find and offer him new adventures that he can manage. We also spent many weekends sailing with my friend on his Hobie cat, (a 16 foot catamaran sailboat). Chad loves sailing, raising his arms to feel the wind, dragging his hand in the water, even getting sprayed as we "fly" through the waves, he giggles with delight. Then during his 15th year, he began signs of puberty. It seemed as if overnight he started getting taller and growing hair in places he never had. With puberty and his rapid growing, his bones became compromised. With his low muscle tone he just doesn't have enough mass to protect his bones. Therefore, a series of "breaks" began. First, he had slipped in his bedroom; a hearty sneeze knocked him over, resulting in a hairline fracture in his humerus. Not wanting to cast it, due to possible muscle atrophy and protein breakdown, we kept it stabilized for six weeks, (still went to the beach). Then, a few months after that healed, I noticed him beginning to limp. After a couple sets of x-rays, orthopedic exams, and finally a bone scan, we found a stress fracture in his femur, just above his knee. Again not wanting to cast him, we dealt with leg braces for about 7 weeks. Also he was not to put weight on it, ok, so now back in a stroller, he is gaining weight, about 72 pounds now and standing 4' 6", and I am barely 5' and maybe 98 pounds. This was VERY challenging. By God's grace we got through that only to take yet another fall about 6 months after his leg healed. This time it was his knee. Back in a leg brace, this time for about 5-6 weeks. This last "break happened in March of 2012. So during all these bone incidents he is continuing to grow taller and gain weight, finally. Just about two weeks into this last period of being in a brace while at school his aide went around the corner to get his stroller and he tried getting up out of his seat, with a brace on, and fell on his face. Nothing broke, but his chin and cheek were bruised pretty good. His brother was picking him up from school that day as I was working. Well Michael, (brother), immediately drove him to where I was working, Michael arrived, ten minute drive, and I still had no call from school. Michael was seeing "red", angry beyond belief. Finally school called, no one saw what happened!!!! So, the next day we took Chad to the doctor and she recommend he not go back to school until his leg was out of the brace as, "they obviously can't handle him". Once he was finally out of the brace, before I sent him back to school I called a meeting with the entire team in his classroom. I outlined EVERYTHING about Chad and propionic acidemia, as it seemed they didn't "get it". With the school year just about over, Chad returned for about a week. This brings my update to June 8, 2012. This morning started as any other, Chad woke about 7am, called "mommy", I responded, "good morning little man, mommy will bring you medicine". I drew up his Allegra, walked to his room with the syringe, and he out of the blue went into his first gran maul seizure. In panic I ran to get the phone, he was safe in bed, his pediatrician didn't answer, seizure still happening, so I called 911. The ambulance arrived quickly and we spent the ENTIRE day in the ER. July 3rd was his second seizure, no ER this time, but that is when we started him on Keppra. He has had a few seizures since we started the med, but the last couple of months he has been seizure free. One of the mild seizures was while in the ocean so he is now reluctant to go in the water, but still loves kayaking and hanging at the beach watching waves and the big splashes!! Backing up a bit, school started August 26. He was to have a new aide this year, he receives 1:1 services, this aide has been in the classroom with him for the last two years so I feel OK with this gentleman working with him. After all he was at my little safety meeting just five/six months ago. Well on September 5 as I was preparing to pick Chad up from school and take him to water therapy, the phone rings, "Sandy, come to school right now, Chad has fallen in the bathroom". I respond, "Is he OK?" the answer back is please come right away. I flew out the door and arrived in five minutes; it usually takes me seven or eight minutes. In the classroom bathroom, there is Chad sobbing with a mouth full of blood and his top lip swollen. I remained as composed as I could, for Chad. After looking him over and comforting him I realized he just wanted out of there. We left and Chad has not returned to the class and NEVER will. That evening after his bath I noticed both knees were severely bruised, and one was very swollen. That was the last straw for me. I contacted an attorney and thus far there is no lawsuit, but believe me I got everything I wanted at the IEP meeting requesting he be tutored at home. We are still watching and waiting to see if his teeth will die and need surgery or if they will live and he will just live with chipped teeth for his lifetime. As for his medical status, still growing, now about 4' 10", 82lbs, and beginning to have facial hair, (not into shaving him, that's just one more thing to do). He is still receiving all his nutrition via g-tube every three hours and overnight. His formula consists of prophree, polycose, pregestimil, propimex-2, cyclinex-2, and his meds are: sodium benzoate, buphenyl, poly citra-k, Carnitor, neomycin, biotin, Keppra, Allegra, lactulose, and of course a vitamin, Thera-plus. Chad has his own language that is easy to learn once you know him, he loves his companion/therapy/service dog, a black lab, and having his brother as a tutor is pretty awesome. His favorite outing is going to our quaint airport where he walks back and forth checking the elevators and watching people hide behind doors, he could care less about the airplanes. It is only at the beach that he enjoys watching the planes fly off into the distance. Our lives are quite simple and complicated at the same time, always revolving around Chad and his wants and needs. Chad has a new weekend aide that he loves, a good friend of mine for over thirty years, she has been a godsend. Life is good, exhausting at times and I give God all the glory and praise for orchestrating our every day. We are on FB, just recently, and I am trying to learn how to post "stuff", so that I can share with others. If you are ever in Hawaii, give us a call. Aloha and blessings to all our OAA friends and families.